Autotask is dedicated to providing innovative cloud-based business management software for IT providers. Accessible from virtually any computer or mobile device connected to the Internet, Autotask features a world-class API, which seamlessly integrates with any other systems and tools that providers depend on to run their businesses. Since 2011, the company has expanded the global availability of its services by translating and localizing its software into six different languages in addition to English. Today, Autotask relies on MadCap Flare, MadCap Lingo, and MadCap Feedback to deliver state-of-the-art documentation and online Help in multiple languages for users around the world. For years, Autotask used Microsoft® Word to develop and manage its print documentation, converting files into PDFs and emailing customers directly on-demand. As the company grew, managing this process and system became increasingly daunting and outdated. 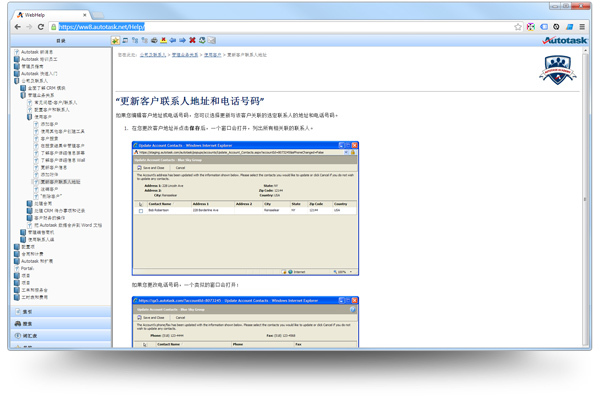 "It was suboptimal," recalled Angela Richer, Autotask manager of documentation and localization. "We needed a tool that would allow us to generate user guides and create context-sensitive online Help." With more than 5,000 pages of documents and growing, Autotask sought out different publishing solutions on the market, which led the company to the MadPak technical communications suite. Of particular interest in the suite were three products: MadCap Flare for single-source publishing, MadCap Lingo for translating content, and MadCap Feedback for analyzing the use of documentation. "With MadCap, we found a solution that would let us do what we wanted with our documentation and expand further into other languages," Angela said. The first step was moving the company’s entire paper-based documentation into online Help. Taking advantage of the intuitive interface in Flare, Autotask was able to complete the task within a year. "Since the authoring environment in Flare looked a lot like Microsoft® Word, it was easy to manage different styles and publish content," Angela observed. MadCap Feedback is used at the bottom of Help topics to gather customer insights. Because Autotask delivers its software as cloud-based services, the company has used Flare to optimize its customers’ online experiences, most notably through the implementation of context-sensitive HTML5-based Help. 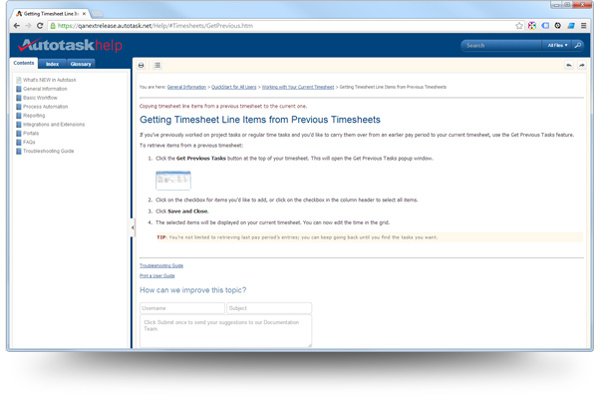 Today every page of Autotask’s software now corresponds to a page in its online Help system. The Flare-based system accounts for several separate projects and applications, including one that manages 1,500 topics. Autotask also has adopted HTML5 to enrich its online Help by developing a frameless, search engine-friendly system for its cloud-based software. The HTML5 output supports partial-word searches, which allows users to type part of a word and quickly deliver results matching those characterssignificantly streamlining the search process. Additionally, Autotask has improved its search results by incorporating a summary sentence at the top of every Help file, so users can immediately gain a sense of what a topic is about. "With HTML5, we have created a nice, modern looking online Help system with a more Google-like user interface that gives our customers a familiar and comfortable search experience," Angela explains. More recently, Autotask has implemented the hosted MadCap Feedback Service to enhance its users' experiences. "We just started using Feedback to gather customer insights and monitor how and what areas of the Help they are using,” says Angela. “This information and the vast number of reports that Feedback provides, will be valuable in understanding how we can improve our documentation to better serve users." Autotask supports a growing number of customers around the world. Today, the company takes advantage of the tight integration between Flare and MadCap Lingo translation management software to deliver its documentation as HTML5 Help and PDF files in seven different languages. In addition to English, these include German, Italian, Spanish, French, Japanese and Chinese. "Our favorite thing about MadCap Lingo is its tight and reliable relationship with Flare,” Angela notes. “Together, MadCap’s products let us flawlessly run our translationsensuring that whatever formatting we have applied will come out exactly the same way in all other languages." Significantly, MadCap Lingo inherits all of the conditional tag settings from Flare, which facilitates the delivery of Autotask's PDFs and online Help content in different languages. She adds, "Using MadCap’s software hasn’t just been about saving time. We couldn't do what we’re achieving now any other way. MadCap has taken us to the next level." 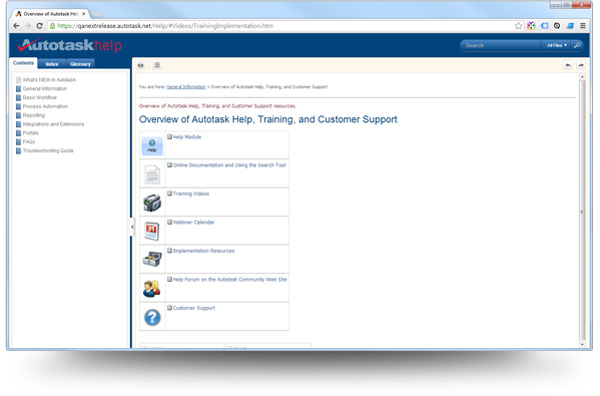 Looking ahead, Autotask plans to expand the online Help system and enhance the experiences of global customers. “We started with one project, and now we're up to six. We definitely will be taking advantage of MadCap software to increase the number of projects we're running and grow our system into other languages," says Angela. Angela adds, "MadCap has provided us with the confidence to advance further. The best part now is looking into new ways we can continue to grow."